Digital data collection through a mobile/smartphone can quickly less consume and particularly reducing paper-based consume which contributing to mitigation of an environmental pollution. It provides more efficient way to collect various types of data/information while paper-based system is not able to collect all those data. In June, the 2nd ICT4D in social advocacy was facilitated discussion on data collection through using Kobo Toolbox. Last month, the 3rd ICT4D inetwork meeting attended by both NGOs in education and social advocacy networking has been still slightly discussed on the importance of digital tools for data collection. Furthermore, there was strongly suggested by some local and international organization and requested for further training. 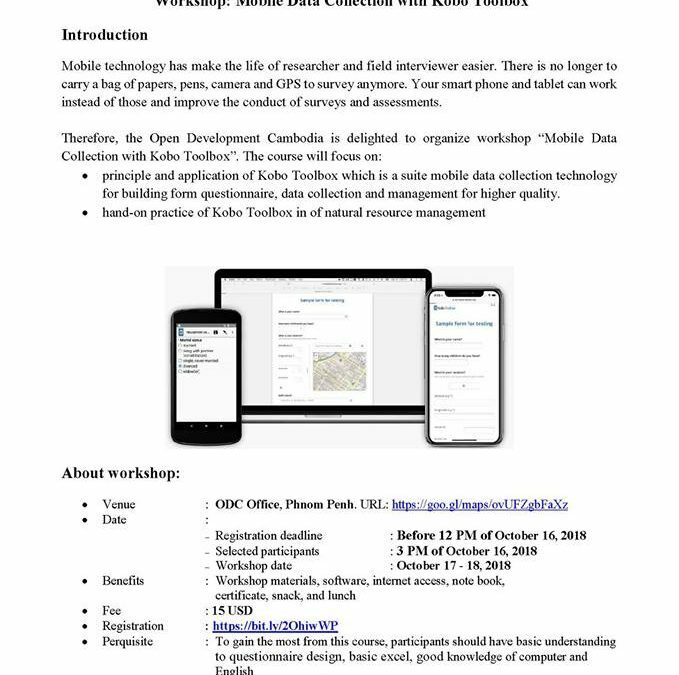 Meanwhile, Open Development Cambodia (ODC) is delighted to announce a two-day workshop on “Mobile Data Collection with Kobo Toolbox” which will be taken place by 17-18 October 2018. We hope this announcement from ODC will of course be addressing the need to them. • principle and application of Kobo Toolbox which is a suite mobile data collection technology for building form questionnaire, data collection and management for higher quality. • hand-on practice of Kobo Toolbox in of natural resource management. If you are interested in another data collection platform called “Surveda:SMS &Voice call data collection platform. Please feel free to contact me @012429597, putheamak@gamil.com or directly email to InSTEDD iLab South East Asia.